Making great music takes a lot of effort. It also costs a lot of money. But you’re passionate about what you do. You love making music. You can’t imagine doing anything else. So you push ahead in spite of any difficulties that have come up – issues with band members, financial difficulties, stolen or broken instruments, and so on. So when you put your music out into the world, you expect people to take notice. You imagine your fans listening to your music and liking it so much that they begin to share it with their friends. You dream about your music spreading like wildfire. You see yourself getting reviews and write-ups in prominent magazines. You envision getting offers to perform at major festivals. You dream of fans lining up to buy your merch at every show you play. But this isn’t an accurate depiction of reality, is it? If you’re reading this, what I just described probably isn’t what’s happening any time you put out a new release. It’s important to have a great product – there’s no doubt about that. But as strange as it might sound, great music just isn’t enough. In the world we’re now in, attention is the new currency. There’s a lot of noise out there, and unless you can rise above it, nobody is going to give you their attention. I’ve had a lot of ups and downs in my music career – I’ve experienced both the good and the bad. And I tried a lot of different things, most of which didn’t work. I would discover some new tactic online, get excited, try it out for a while, and nothing in my career would change. I might be a slow learner, but I’m not dumb. I thought that if I just exerted enough effort, and if I kept trying, the gods of music would grant me my wish of fame and fortune. Well, that didn’t happen. And if I just described the predicament you’re in, let me level with you – I don’t think it will happen for you either. Put your best effort forward in promoting a show, only to have no one show up? Put on the show of your life to a lukewarm reception? Felt like no one ever cares about the things you post on your blog or social media? Given away your album as a free download, and had no takers? Dropped the price on your album during the holiday season and had no one buy it? The bad news is that you’re in a rut, and if you don’t do something about it, you won’t be able to climb out of it. Does It Feel Like You’re Screaming Into The Void? That’s because you probably are. Whether you’ve noticed it or not, it’s very likely that you’ve gotten increasingly desperate with your communication. This probably didn’t happen overnight, but as the days rolled by, you started to feel like the world was against you. Or worse, you may have started complaining to your fans via email: “Guys, this is how we make our money. If you don’t support us by buying our album, we’re going to go broke trying to pursue our passion” (I’ve seen theses types of messages of Facebook by the way, and it’s not pretty). I hope not, but I’ve noticed that even musicians that may not be that bad off say things like that. And the problem is this: people smell desperation. They’re not going to support you if they can smell it on you. If this is the best strategy you have for getting the attention of fans and future fans, you’re in serious trouble. Why? It’s simple. Because if you can’t keep the fans that already love your music, you’ll have to keep making more fans to replace the old ones. It’s a vicious cycle! You’re here because you’re having trouble getting people to listen to your music. So let’s not worry too much about the people that aren’t buying, because if you can get into the ear buds of more listeners, sales will naturally follow. If people hear your music, and they like it, they are more likely to buy it. It almost inevitably happens that way, because the days of people buying random CDs off of a shelf are over (CDs? CD stores? There are barely any left). It’s not an easy question to ask (or answer), so I have to commend you on your bravery. But I’m not going to leave you hanging. I want to share with you an easy tactic that can instantly increase your listenership. No problem – just hear me out. Hey, @davidawiebe [Band Name] Releases New Album: [Link]! Sure, I might click on the link. Maybe I would even take a quick listen. If I was feeling particularly generous, I might even shoot you a quick response. The chances of me becoming a fan are close to zilch though, because I might not even listen to your album in the first place. I’ll be honest – I ignore most communication that isn’t personalized. I get a lot of junk mail from people wanting to do “business” with me. I’m sure you do too. This is why blanketing a ton of email addresses with your latest press release won’t work. If the message isn’t coming from someone I know, and it doesn’t express any kind of understanding about who I am or what I do, I move on. Life’s too short for impersonal email, man. Hey, @davidawiebe I read your latest blog post on [Topic]. Good stuff! Odds are very good I will actually respond to you. Brownie points if you retweet the “latest blog post on [Topic]”. @davidawiebe I had a quick question about that post: [Question]? @davidawiebe you know your stuff. It would mean a lot to us if you could listen to our EP and offer your feedback. Can I send you the link? You’ve demonstrated interest in what I do, you’ve helped me out by retweeting my post, and you’ve appealed to my ego. Do you really I think I would say “no” to you at this point? At worst, you got someone to listen. At best, you just earned the attention of a new fan. And even though I used myself in this example, this really has nothing to do with me. It has everything to do with your music and all of the influencers whose attention you wish you had. Is this a fail-proof method? I’m afraid not – no such thing exists. Some people won’t respond to you, and some won’t give you the time of day. But creating personal connections can and will make a huge difference in your music career. You’ll definitely get better results than just shouting from the rooftops. This principle applies to real-life situations too. If you apply what you’ve just learned, you will see some results. But if you’re serious about people hearing your music, and you want to get more attention for it, then we’ve really just scratched the surface. There’s so much more I want to share with you. If you do nothing now, nothing will change. 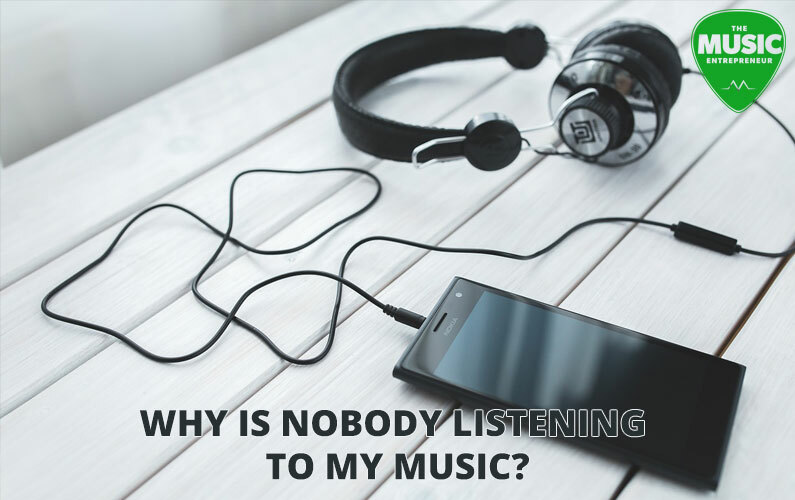 No one will hear your music, and you’ll continue to reek of desperation. But, as difficult as it might be, if you start pushing for change, things will begin to turn in your favor, little by little. After all, insanity is doing the same things expecting different results. So start doing something different now, because if you’ve read this far, you’re clearly looking to get different results. If you enjoyed what you read, go ahead and join the email list. I look forward to connecting with you.